Arriving at Macquarie Island knowing you are one of the lucky few who holds a visitor’s permit to go ashore invokes excitement and anticipation. The low cloud that smothers the hilltops adds to the island’s mystique, and penguins and birds bobbing on the ocean give a glimpse of the prolific wildlife to be experienced ashore. 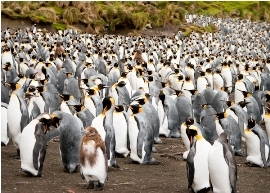 Located in the Southern Ocean about half way between Australia and Antarctica, it is an ideal destination for wildlife lovers, photographers, adventurers, and those who just want that “once in a lifetime” holiday. There are two main landing sites on “Macca” (as it is affectionately known by the 60 or so scientists and rangers at Australia’s research station). The day’s expedition begins as we disembark from the comfort of our five-star expedition cruise ship, Orion, into a 12-person rubber zodiac that rises and falls with the waves in stark contrast to the stability of Orion. Shore landings are “wet,” meaning the zodiac pulls up close to the shore and you hop off into water where the landing crew are waiting to aid you ashore. Our first shore trip was to the research base at the island’s isthmus. 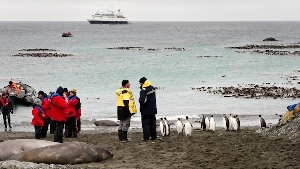 Curious King Penguins and lazing Elephant Seals supervised the landing from no more than an arm’s length away. King, Royal, Rockhopper and Gentoo penguins all call Macquarie home as well as Elephant Seals and several species of sea birds. Rangers provide a tour of the station and surrounding grounds and are happy to answer questions and share their stories of life on the island. The second landing site is Sandy Bay and we are awestruck at the incredible sight of tens of thousands of penguins and pods of Elephant Seals lazing close together on the beach. Our wet landing was again supervised by the resident wildlife. Underfoot there are little white bones of penguins next to larger bones of long gone Elephant Seals. The Brown Skuas act as the island’s cleaners and we see them at work on the carcass of a huge seal. Engaging directly with the wildlife is prohibited. The penguins nevertheless are inquisitive and as long as they come to you, you can get extremely close to them. A tip to encourage them is to squat down and waddle your backside from left to right! The wildlife was once the target of sealers who, after slaughtering all the seals, turned on the penguins. Today, though, the island’s population of seals and penguins has returned and in 1997 Macquarie was listed as a World Heritage Area. Visits to Macquarie are typically during the summer months of December and January. The temperature during the day is about 8°C (46°F). Expedition cruises are the best way to visit; however, very few operators venture to the island due to the limited number of visitor permits. It is worth seeking out those that do as it is a truly memorable and unique journey. 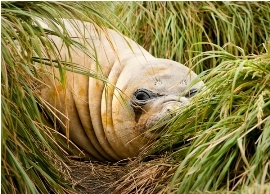 At the time of this writing Orion Expeditions and Heritage Expeditions operate tours to Macquarie Island including shore landings.